Liquidity is the big factor which drives the overall stock market. But liquidity is not measurable; it has no units. It is like the wind—you cannot see the wind, you can only see what the wind does to trees, buildings, carports, etc. If you want to know what the wind is doing, you need a windsock. And if you want to know what liquidity is doing, you similarly need an indicator of what liquidity is doing, good or bad. This week’s chart does a pretty good job at that task. And it comes from an area which several other analysts have maligned, which of course makes it even more fun. There are some analysts who will tell you that the problem with the NYSE Composite Advance-Decline Line (A-D Line) is that it is contaminated by all sorts of issues that are not really “stocks.” And in part that is true; only about 60% of the NYSE-listed issues are what anyone would agree was a real “common stock,” i.e., an operating company. The other 40% are comprised of preferred stocks, closed-end funds, structured products, and other flavors of investment products that are not really “normal” stocks. And these alternative types of issues are often criticized for messing up the proper stock market data. And that criticism really makes a lot of rational sense. If you want to know about the real stock market, you ought to look at real stock market data. You should therefore filter out the message from contaminants that are not real stocks. That is how the universe should function. But as with any belief that seems right, and that lots of people believe, sometimes the contrary position is the right one. Bond-related closed end funds (CEFs) are often cited as the worst of the “interest sensitive” contaminants to the A-D data. Once again, that makes sense. But an evaluation of the actual data shows that these issues somehow seem to know better than “real stocks” what liquidity is doing in the market. It turns out that the bond CEFs, which are supposedly contaminating the NYSE Composite A-D data, appear to know better what the real situation is. I first started tracking this data back in 2001, thinking, as others do, that if I could somehow purify the A-D data, then I would get better answers. I set up a data-analysis routine that can separate out all the NYSE-listed issues into the category they fall into. But once I ran the data through a centrifuge to separate out the “real stocks” from the supposed contaminants, I found that my hypothesis was wrong—the chaff was worth more than the grain. It turns out that the bond CEF A-D data are actually better than the A-D data for the “real” common stocks. Go figure. It is a huge pain to do this work on the stock market data, but it turns out to be worth the trouble. 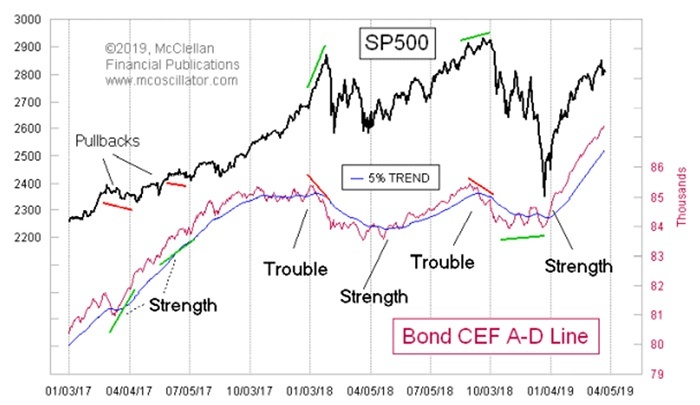 The bond CEF A-D Line has arguably done a better job of warning of trouble and upside potential than the real composite NYSE A-D Line. This means that rather being a contaminant, the bond CEF A-D numbers are making the composite data better by their inclusion. Perhaps we should set aside the A-D data on “real” stocks and look at better canaries in the coal mine for answers about how liquidity is doing. For now, the bond CEF A-D Line is making new all-time highs, saying that liquidity is plentiful. A version of this article was first published by McClellan Financial Publications on Mar. 28, 2019.